Are also known as Chinese lanterns, flying lanterns and wishing lanterns. The lanterns have been used in Chinese and Thai celebrations for thousands of years. It was believed that wishes written on lanterns would rise up to the heavens and bring good luck and prosperity. Sky lanterns are becoming popular way to celebrate special occasions as they are a beautiful and fascinating way to light up the sky. Risks to livestock and animal health including marine animals. Fire risk and damage to crops and property. Impact on the environment, including littering on land and at sea. Risk to coastal rescue services. Consider the potential for causing fires. And the affect this could have on both the countryside and individuals property. Think about the local area for the launch and intended flight path. The user mostly controls the launch of the lantern. The actual flight path and end destination are not controlled by them and will depend on weather conditions. Use only biodegradable lanterns rather than wire framed versions. This will eliminate the possibility of harm being caused to livestock by it being ingested or incorporated into feed. Only use only in very calm wind conditions. Never use if the wind speed is above 5mph. Do not use near dry crops, haystacks or other materials that may catch fire. Do not use near power lines. Do not use in very dry conditions. Never use within 1km of standing crops. Never use within 1km of a road. Do not use within 5 miles from airports and remember if they are being launched within 10 miles of an airfield air-traffic control should be notified. Be aware of any other local conditions that could affect the launch, like crops, wooded areas, heaths and thatched buildings. Make sure there is sufficient clearance to avoid trees, power lines or buildings. Avoid areas where confusion may arise with distress signals. Always follow the manufactures user instructions. If you are planning on launching lanterns within 10 miles of an airfield air-traffic control should be notified, remember that lanterns should not be launched within 5 miles of an airfield. Only responsible adults should use lanterns. Do not drink alcohol if you are going to be responsible for lighting and releasing the lanterns. Do not smoke whilst handling or launching the lanterns. Keep the launch site clear of flammable materials. Make sure you have water available at the launch site, clothing or lanterns may ignite if the correct launch procedures are not followed. Keep children, pets and spectators a safe distance up wind from the launch site. Two adults are required to correctly launch the lanterns. Do not attempt to launch damaged lanterns. Be aware that writing messages on the lanterns can cause damage. Do not tie anything to the lantern. It may cause instability which could result in igniting the lantern. Check the wind direction before launch. 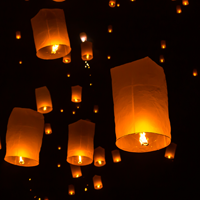 The Trading Standards Institute has published a code of practice for sky lanterns.